According to the Experian National Score Index, which provides insight into consumer trends by monitoring several components of consumer credit behavior, the average U.S. credit score is 687. The New England region has the highest average at 707 while the West South Central region comprising Texas, Oklahoma, Arkansas and Louisiana has the lowest average at 669. 1. VIP Status. When your credit scores are high, the credit card companies want to keep you around giving you more power than you may know. The higher your credit score, the more power you have. 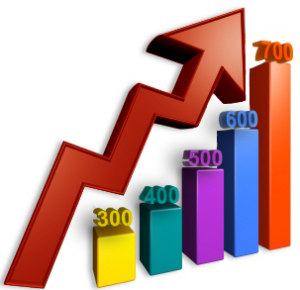 A credit score of 700 is a good place to start using your power but a credit score 750 or above makes you a superstar. What can you do with the power? Well, if you are not pleased with something making a polite stink may get the issue changed. Don’t like being assessed the annual fee? Let your credit card company know. Your bargaining power is higher when your credit scores are higher. Want a credit line increase without a credit report being pulled? Just ask. VIP Status can get you automatic or requested credit line increases without a hard inquiry being placed on your credit reports. If you do have to request a credit line increase tell them you want to use your card more to earn points, miles or cash-back rewards and watch your credit line skyrocket! 2. Negotiate a lower interest rate. Credit card companies know consumers with better credit scores have way more choices than consumers with lower credit scores. They also realize there is heavy competition for your business. You are the captain of your financial ship. As the credit card offers come in the mail, carefully review them for lower interest rates, better terms, rewards and perks. Let your current credit card company know you are contemplating closing your account and opening a new account due to lower interest rates or better terms and rewards. Be pleasant and let them know how much you like their credit card company and how you would prefer to remain their loyal customer if they can match the new offer. You may have to speak to a supervisor but remember not to be confrontational. Maintain professionalism and politeness throughout negotiations. You have a good chance of getting what you want. However, you may have to try more than once. 3. Request a Goodwill Adjustment. A credit score of 700 or above affords you the opportunity to request a goodwill adjustment should you ever be late paying. This is not necessarily a written rule for credit card companies but many will forgive a late payment if you request it, especially if you otherwise have an excellent payment history. Again, you may have to speak with a supervisor or manager to request this but it can be done. Being polite and having a good reason why you were late usually works a lot better than demanding a goodwill adjustment. Your plea for a goodwill adjustment should also include your desire to maintain a good credit score by not having a late payment reported to the credit bureaus. These are just a few benefits of having a credit score of 700 or above. Of course there are many more benefits; but a lower interest rate and no annual fees credit cards can save several hundred dollars a year. If you are a consumer with good credit, make it work to your financial advantage.